The bald eagle became the national emblem in 1782, when the great seal of the United States was adopted. The range of the bald eagle encompasses most of Canada and Alaska, all of the contiguous United States, and northern Mexico. 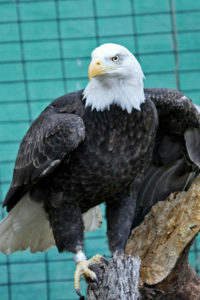 The bald eagle is a large bird, with a body length of 28-38 inches and a wingspan of 66-88 inches. Males weigh 6-14 pounds, and females are about 25% larger than the males. Conservation Status: Removed from Endangered Species List, but protected by national law. The term ‘bald’ is a deviation of the Old English word balde, meaning white.